Michael Cooper grew up in the west of Ireland and now lives and works in Buckinghamshire. His sensuous animal and human forms are carved in marble or stone or cast into bronze. 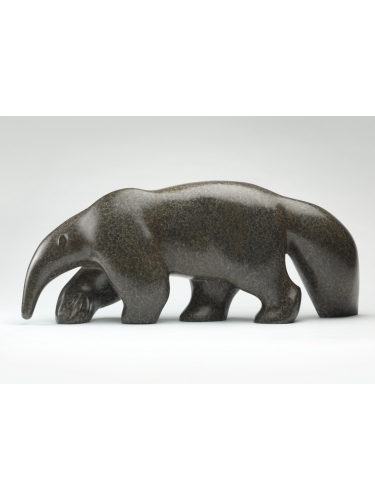 His empathy for his subjects allows his chisel deftly to reveal not only the inner calm and beauty of the stone but also the essence of the animal itself. Cooper’s sculptures are dignified, self-assured, independent and respectful. They have a deep and quiet energy perhaps imparted by the long hours of chipping which bring them forth from the stone. His work brings the third dimension vividly to life through the irresistible urge to feel and caress surface and form and this abstract, almost musical pleasure is essential to the appreciation of his sculptures. Cooper is a Fellow of the Royal Society of British Sculptors and has exhibited widely both in Britain and abroad. He has completed several large scale works including a four ton Gorilla for Lord Carrington’s Sculpture Garden, a 1.5 metre high Bear for Bicester Village in Oxfordshire and a reclining figure in Travertine Marble for Covent Garden in London.